As part of your security and verification protocol, players are required to activate their account as soon as they register. This one-time procedure ensures that the email address you have provided belongs to the rightful owner of the account. This notification confirms that an email has been sent from the EmuCasino team to your registered email address. In your personal email inbox, you should receive an email from the EmuCasino team. Once you open the email, players should receive an email from the EmuCasino team with the following content. Now, you have two options, either click on ‘Activate Account’ and the EmuCasino website will open in a new tab. Alternative, you can copy and paste the link on a new tab. 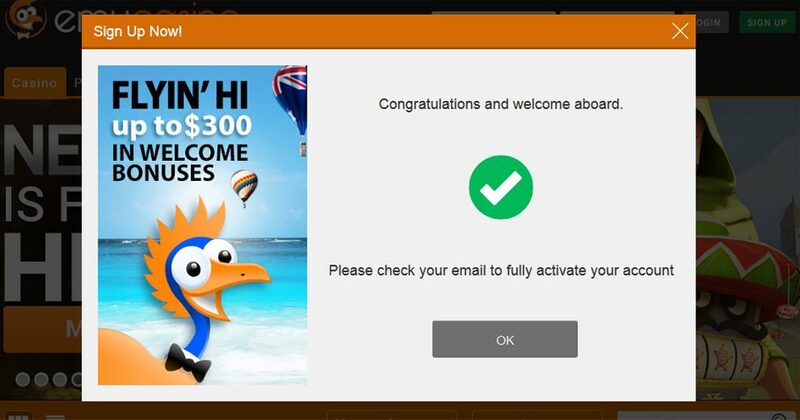 Once the EmuCasino webpage open after following the link on the email, players will receive the account active confirmation notification. • Did you check your junk email folder? • Did you enter the correct email address during registration? 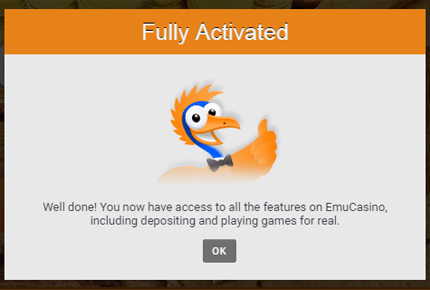 • If you still have not received the activation email, feel free to contact our customer support. • After you have clicked on the activation link and you do not see the message on the right, contact our customer support team.